If there is one constant about the theocracy controlling Iran, it’s the fact they cannot tolerate dissent or protest of any kind. The legitimacy of most governments on this planet tends towards the democratic side with free and open elections. Sometimes there’s a monarchy, but it’s a constitutional one restrained by a parliament. But there are a few countries out there that still adhere to the authoritarian model where elections are rigged, competing political parties are banned and membership or active participation in dissident activities can get you tossed in jail or worse, executed. Iran happens to be one of the latter types of state. Ever since the mullahs stole the revolution toppling the shah and turned Iran into a medieval, sectarian state, they have zealously gone after any form of dissent and sought to stamp it out. The history of the Mujahideen-e-Khalq (MEK) is one example. It stands as the longest-running opposition group among the Iranian diaspora and has worked relentlessly to oppose the mullahs by revealing the depths of human rights violations within Iran, uncovering the secret nuclear program there, and smuggling out videos and reports of oppression and protests inside the Islamic state. For all its efforts, the mullahs have made the MEK enemy number one and have sought to attack them physically with military strikes at MEK refugee camps in Iraq and a recent attempt to bomb an annual gathering in Paris by Iranian agents. The regime has sought to nullify the MEK’s effectiveness politically by first getting it ironically labeled as a terrorist organization by the U.S. only to finally get itself removed by the Obama administration, and then it aimed its lobbying and PR operation at trying to vilify the resistance movement with various canards such as it lacks any support within Iran. It would be hard to label anything coming from the Iranian lobbying machine as truthful since the mullahs have tried their hardest to kill, imprison or hang every MEK member they could get their hands on. But the MEK is not the only opposition group getting targeted as the mullahs turned their attention to the Democratic Party of Iranian Kurdistan (PDKI), an armed opposition group fighting for greater autonomy for Iran’s Kurdish community, with an attack on a base in northern Iraq, killing at least 11 people and wounding scores more according to Reuters. 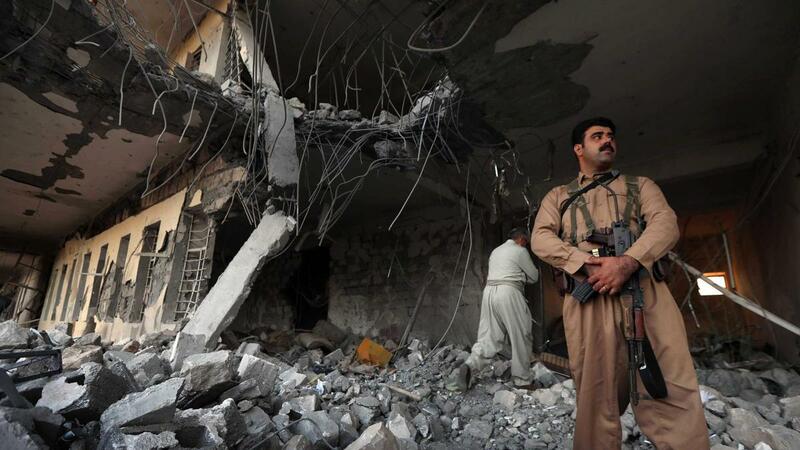 The PDKI tweeted pictures and video of explosions, as well as of the wounded, at its headquarters in Koya, in Iraq’s semi-autonomous Kurdistan region. “According to initial reports, 11 people were killed and between 20 and 30 wounded,” said Major General Jabbar Yawar, a spokesman for Iraq’s Kurdish Peshmerga security forces. Yawar said the area that had been attacked included a residential complex for the families of party members. The attack represents the same pattern used by the Iranian regime to strike at opponents anywhere outside of its borders. It showed no compunction about assassinating MEK members in Iraq and Europe and certainly has no regard in striking at PDKI members in Iraq. It further demonstrates that for all the talk of moderation voiced by Iran lobby members such as the National Iranian American Council, the Iranian regime is steadfastly committed to using violence to achieve its goals, even if it means regularly violating the territorial sovereignty of another country. The United Nations Assistance Mission for Iraq (UNAMI) on Sunday urged the Iranian government to respect Iraq’s sovereignty following the attack. Iraq’s Foreign Ministry labeled Iran’s bombardment of the Kurdistan Region’s town of Koya as a violation of the country’s sovereignty. This heightened focus on flexing its military muscle was showcased by top mullah Ali Khamenei who urged Iran’s armed forces this weekend to increase their power to “scare off” the enemy; presumably the U.S. His speech came before the attack on the PDKI to a graduation ceremony for Iranian regime’s army cadets. State television also showed Khamenei praising the Iranian regime’s naval forces in the Gulf of Aden, off the coast of Yemen, while speaking to their commander via video, according to Reuters. Meanwhile, the U.S. Navy conducted exercises this month to ensure its readiness to guarantee freedom of movement through the Persian Gulf and the Red Sea waterways amid escalating threats from Iran to disrupt shipping across important choke points. The Iranian regime has threatened to halt exports through the Straits of Hormuz, a vital channel for Middle East oil, if it’s barred from shipping its crude through it, according to Bloomberg. The laundry list of militancy from the regime ruling Iran doesn’t stop there as it announced the completion of a new facility to build advanced centrifuges to expand its uranium-enrichment capacity. Ali Akbar Salehi, the head of the Atomic Energy Organization of Iran, said the facility at the Natanz nuclear plant would be completed within a month. The development represents one of the key flaws in the Iran nuclear deal which allowed Iran to develop and operate advanced centrifuges far superior to what it was using before and that with little effort could be made to operate in producing weapons grade nuclear materials. The last indicator of just how unserious the Iran regime is about diplomacy came in remarks by Hassan Rouhani stating that the regime receives a constant stream of messages from the U.S. to restart diplomatic negotiations. But Rouhani criticized the overtures and did not commit to starting any diplomatic dialogue; a far cry from the promises made by the NIAC that diplomacy was the only sure pathway to peace for the U.S. and Iran.